Thank you Minted for sponsoring this post; however, all thoughts and opinions expressed are my own. This post may contain some affiliate links which I can potentially make money from to keep this blog going. I love decorating as the seasons change. Switching out from spring to fall and then fall to winter. I also love finding unique pieces for my home during the holiday season. 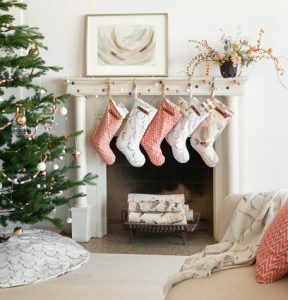 Minted is the perfect one stop shop for all my home decor needs, seasonal or not! I’d love to have my whole house be decorated and filled with minted goodies. So I wanted to share some of my favorites with you, and sorry if you think my list is long, but again…. my goals are to eventually fill my home with Minted decor and accessories. All of the stockings match but aren’t too matchy matchy. 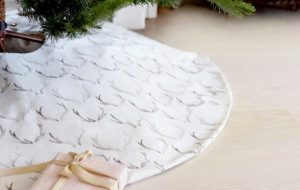 These 2 sided mix and match tree skirts allow you to switch up your style year to year or even for a home party. I love that again these skirts follow the same fabrics as the stockings. These are the ones that Joe and I picked for us. Then I got 2 other styles for Izzy and Teddy. As you can see, they aren’t matchy matchy, but they do go together. 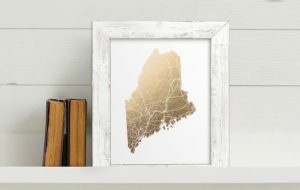 Being the State of Maine is my home State and a place we would like to potentially move back to, we loved the idea of having this gorgeous art displayed in our home. Oh and I went to my cousin’s house and Maine and guess what, she had this hanging in her living room! Great minds, hehe I thought it was so fun that we picked the same art. 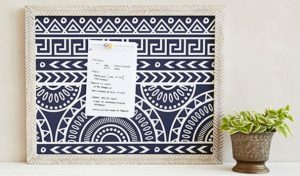 There are also multiple options to get a frame that will meet your home decor needs. There are multiple styles and then colors to chose from in each style. Not to mention different sizes. 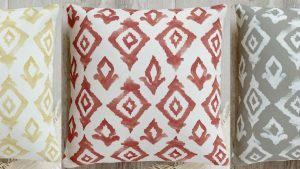 So you can get the same pillow in different sizes but same color or vise versa. These shelves are all gorgeous and there are so many styles. From a weathered and country look to a bit more modern, there are so many styles and sizes for multiple functions. These are so fun for your office, the kitchen, a kids playroom… let your decorating imagination run wild. They also come in multiple colors, designs and sizes! This is a fun gift for your kid, a grandchild or even a niece or nephew! They fabrics are designed by artists and seriously gorgeous! The clutches come in 2 sizes and multiple colors. They are simple and chic. 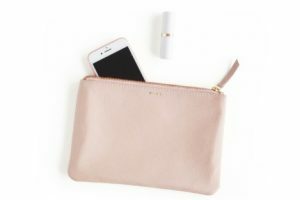 Being a busy mama, I can’t have enough little organizers in my purse or diaper bag. From cards, to stationary, art, aprons, teepees and more you will find many gorgeous pieces designed by artists. 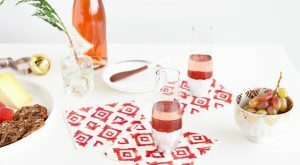 Have you bought from Minted before? What are your favorite purchases? Your home is beautiful! I love all the little details ? I’ve only bought prints. I keep eyeing the personalized silouette pictures. Love the foil art and stockings!! I love all these details and now I totally want some home state foil art!! So much detail, so much to love! Those are all so classy and chic! Love it. 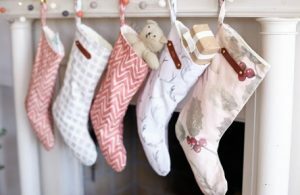 I just can’t get over your stockings! Great ideas! 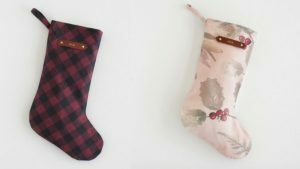 We haven’t bought from Minted before, but do have plans to do update some home decor in the new year. I’ll definitely keep them in mind! Yes start looking over everything they have! So many goodies ?? I didn’t realize they had all of these options! Isn’t it mind blowing how much they have?